Artsy Mama is hosting a virtual party in honor of the current issue of Artful Blogging and to celebrate artful bloggers. She invited people to share an artsy blog post and maybe a tutorial as a way to participate in the party. There are already some incredible links to posts over on her site. When I first started blogging, I did not realize how the medium itself and the inspiration I found from others would invite me to dive deeper into a more creative path. Within a few months of beginning my blog, I went from someone who knew which show she watched each hour on the hour during primetime television to someone who spent a lot of free time sewing, sketching, writing, taking pictures, and filling up idea journals. 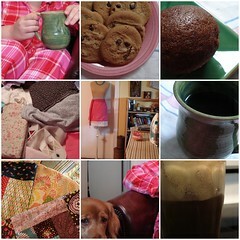 Being an artful blogger gives me the chance to share what I learn on my journey; my blog is a place to record my observations, my joys, my sorrows, my growth, my not-so-great moments, my truth …It has become a place where I can just sit down comfortably in my favorite pajamas, take a breath, and be me. So….Welcome to my little corner of the world! The music line-up is, of course, The Weepies followed by some Paul Simon, then a little Indigo Girls and some other favorites. When you hear the first few bars of Tina Turner's "Proud Mary" get ready because we are all going to stand up and dance, dance, dance. Yes, that means you over there too. Block out a certain amount of time just for yourself, from 10 to 45 minutes (or longer if you like). You are going to spend this time outside. You could simply take a walk near your home, spend time in a neighborhood park, walk downtown, along the water, in the woods…anywhere. You aren't going to take anything extra with you. No sketchbook or journal or camera or cell phone. Just you. What do you (want to) touch? Feel free to touch things and notice that as well. If you find your mind wandering away from these things to grocery lists and what you "should" be doing and other things that pull on you, pause in your walk. Close your eyes and take a breath. And then another one. Allow yourself to just notice your inhalations and exhalations. After a few moments, begin to notice your senses again and open your eyes when you are ready. After you have finished your walk, head back to your creative space. When you get there, spend time creating, writing, journaling about your experience. You might want to create an art journal page or a color palette of what you noticed. You could write about each sense and what the experience was like for you. You might want to write a poem. It is all up to you. Simply allow your senses walk to be a springboard into creating. I recommend that you head back to your creative space at home so that you won't be distracted by new senses experiences while you are creating. Meaning, if you went on a walk near a lake and then decided to sit down and journal about it near the water, it becomes a different exercise. While you are writing, your senses will notice new things and so on. That is a valuable exercise as well, but this one is centered more on observation and then removing yourself from what you observed. If home might be too distracting, you could head to a café to journal/sketch about your experience. Shape this exercise to be whatever you need. Finally, as you reflect on your observations, sit and think about what I call the sixth sense: know. (If you have visited me before, you might have seen my "senses" posts. I always include this sixth sense.) Reflect on what "you know" from this experience. You might want to journal about this. To visit other folks participating in Kari's party, check out the ever-growing list of links at the end of her post.